From the moment we landed in New Zealand, I knew that we were in one the most beautiful countries on Earth. Sure, I had spent hours eyeballing internet imagery and knew it was going to be exquisite. But nothing compares to experiencing it first hand. The country is the definition of utopia, elaborate with diverse landscapes and climates, brimming with friendly locals, travelers and happy farm animals. As opposed to a lot of the yearlong travelers we met, Jared and I had three weeks to experience the country's vast scenery. With that timeline, we stuck to venturing around the South Island. If you are reading this and are planning your own trip to NZ (whether it's booked or a bucket list) this would be my one piece of advice: go for as long as possible. To maximize on our time, we adhered to a 2 night minimum stay so we aren't continuously packing, unpacking, checking in and checking out of AirBNB's. Below is our three week itenerary and a few helpful tips about traveling through the country. Reach out or leave a comment if you have any questions or additional advice for readers. Beginning in Abel Tasman was 100% intentional. We needed to experience the opposite season than the one we were in. We enthusiastically traded in short, dreary winter days for the heat wave of summer. Exposing our skin to the sun was marvelous and I was surprised at how the act of wearing a bathing suit could be a source of so much joy. We took a 2 hour water taxi ride which dropped us off at Totaranui, a popular beach for locals. On the way in we saw seals, sting rays and got a historical background of the park from our driver. Once we were dropped off, we started towards our first camping spot at Onetahuti Bay. Out agenda was simple; soak in the sunshine and get some water therapy. In between that we cooked, read and made conversation with other campers. Two in particular, a couple from Wellington were on a tour promoting a waste-free life. Read about how they inspired my post about reducing waste while traveling here. The second night we camped at Te Pukatea, a section of the trail accessible only by boat or hiking. There were only 7 campsites, and we found ourselves alone much of the time. We enjoyed the quiet and reveled in our distance from technology. For some, having no cell phone service is a cause for a breakdown, but we love it. Jared actually kept his phone off the entire three weeks! Make sure to sunscreen your entire body. I forgot to cover my feet and my poor feet burned, which then caused them to swell and created nasty blisters. On the day you hike out, stop at Hooked On Marahau to refuel before hitting the road. I don't typically eat meet but holy hell that burger was divine. But seriously, a burger and beer after hiking is so necessary. The Hooked Cafe is conveniently located right outside the park. From Abel Tasman we drove south west towards Punakaiki. Jared had found a sweet off the grid cabin and we splurged by booking 3 nights. We didn't have any plans, which was probably a good thing since a cyclone rolled in and we couldn't leave our cabin! We were safe, but stuck in the cabin for over a day. We did manage to take a quick trip to the popular Punakaiki Pancake Rocks. A short, paved loop trail takes you through incredible Limestone landscapes. It was one of the most "touristy" things we did, but it was fascinating to read about the rocks 30 million year old history and how they were formed. * We found the cabin on Canopy Glamping. Our off the grid-hut was built by a local builder and artist, and consisted of two small timber huts, adjoined by a covered outdoor kitchen and living area. Everything from the furniture and decor, to the materials used to build the hut were intentional. Wanaka was one of two towns we stayed in and we fell in love with it instantly. Any location that combines easy access to the outdoors, healthy creative food options, and a friendly community immediately has me daydreaming about a move. Wanaka gets bonus points for being surrounded by water. Everyday, we followed the same simple pattern of coffee + breakfast, a hike followed by lunch and another coffee, downtime (reading/nap), a walk around town, and dinner. I love staying in a place long enough to develop a little routine. Below is a list of hikes we did and cafes/restaurants we ate at. The proximity of this hike from town makes it an accessible trail for travelers. From the lake level, a steep gradient begins and doesn't let up till you finish at the top. There is a 4,000 feet elevation gain in the (almost) 5 mile climb. The views are spectacular and urge you along the way as you pass farmland, tussock and on a clear day, Mt. Aspiring. This trail can be summed up in one word: diverse. Along the short 3.2 mile walk to the glacier, you pass through a gorge, beech forest, and an alpine valley. The drive to the trailhead felt longer than the hike itself, but the valley floor is gorgeous and home to adorable roaming cattle and sheep. This peak tops at around 4,543 feet and is similar in length and elevation to Roy's Peak. The track overlooks Lake Wanaka and Lake Hāwea, with views of the Southern Alps and the town. It's a long steady climb that's well maintained and not as crowded as Roy's. The best part (in my opinion) was walking through the fields of alpine tussock. Moody clouds rolling in as we climb to the top of Isthmus Peak. Feeling wind and freedom at the top of Isthmus Peak. The Big Fig: "slow food served fast" - Modern Middle Eastern eatery right on the lake and open all day. Finish off your meal with one of their carrot cakes. Francesca's Kitchen: Arrive early or book reservations in advance. Authentic, affordable Italian cuisines and an extensive New Zealand wine list. Kika: One of our top meals while in New Zealand. The trendy spot is tapas-style dishes that are inventive and seasonal. We were close to returning for another dinner but opted to try something new. Jared and I shared the Roasted cauliflower, whipped tahini, pine nut furikake and dates, the Roasted carrots, harissa, yoghurt, rye granola, and the Lamb shoulder, preserved lemon, rosemary, chilli. I would order it all again in a hearbeat. 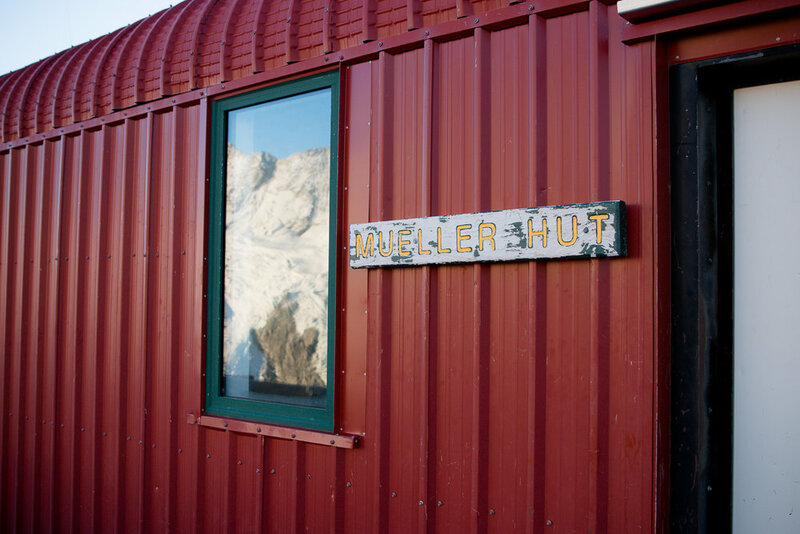 Staying overnight at the bright red Mueller Hut was one of the highlights of the trip. You know how some trips (or more specifically hikes) are about the journey? Well this one wasn't. This hike was definitely about the destination. It is only 3.2 miles but has a total elevation gain of 3,280 feet. I hadn't looked into it until I searched online and saw the estimated climb time of 4 hours. That long of a trek for that short of mileage usually means one thing- UP. The first bit is stairs, stairs, and more stairs. We passed a guy coming down who said "this was the stairway to heaven, now it's a stairway to hell." With my mental and physical energy focused on the uphill, I couldn't be bothered to think about tomorrow when we too, would be headed back down. We finished in 2.5 hours and I hastily bundled up on the deck of the hut, ate my sandwich and fell asleep in the sun. The remaining hours of the day passed slowly. We chatted with day hikers, explored the surrounding area and made a little home in the bunkhouse we shared with the other overnight hikers. Our hut warden for the night was Neville, a local kiwi who had been volunteering at Mueller for the last 10 years. He pointed out the mountain ranges in view, gave us a history of who climbed it when (shout out to Freda Du Faur, first female to climb Mt. Cook), and what stars we would see as the day shifted into night. Within 12 hours, we experienced the the most spectacular sunset and sunrise. At almost 6,000 feet up, we had a 360-degree panorama encompassing glaciers, ice cliffs, and some of New Zealand’s highest peaks. By the time we began the Kepler Track, we had hiked 6 days in a row. My body felt simultaneously strong and drained. I knew it would be a great hike but I was also craving stillness and a soft bed. We had originally planned to do the hike in 4 days but ended up finishing in 3 because that soft bed was calling both our names. Not to mention we were both getting eaten alive by mosquitos and we had hit a hiking breaking point. We started the hike in mid afternoon but walked a relatively flat and shaded 9 miles to our first camp spot at Broad Bay. We began the second day early, knowing that we had 15 miles to go with the most elevation gain of the trek. We stopped at the Luxmore Hut for a quick snack, bathroom break, and to layer on more clothes. Now that we were at the ridge line, the temperatures were much cooler and the wind was whipping. Raindrops felt intermittently as we walking along the spine of the mountains. It was the highlight of the hike, looking down at the lakes and seeing other mountains jut out from the water. At around mile 10 we began the descent and with every achy step we got closer to our home for the night, the Iris Burns Hut . Sleep came really easy that night. On day 3 we began the trail early, moving quickly through the beech forest and finally back to the car park. We were able to book an extra night at our AirBNB and were enjoying and a shower and Netflix by sundown. Our AirBNB was situated out of town on a lovely farm and we didn't venture to town that often. Multiple people told us to go to Doubtful Sound vs Milford (because Doubtful was the less busy/chaotic spot) so we did book a full day tour though Go Orange cruise. Despite Seattle-like weather, cruising through the fjords was gorgeous and it was a nice break from being on our feet. We did drive up to Milford Sound just to take in the scenery and stopped to do a quick hike to Lake Marian . The rest of our time was spent on the farm or near Lake Te Anau. It was the perfect way to spend our last few days in New Zealand.